DVD to MP4 2019 | How to Rip DVD to MP4 with HandBrake on macOS Mojave etc. Well-known as one of the most popular, trustable and open-source programs, HandBrake comes to fashion a trend of ripping and converting DVD to MP4/MKV video file, the former of which own better compatibility for cross-platforms, like Windows PC, macOS (10.14, 10.13 etc. ), iPhone, iPad, Android, Windows 10 mobiles/tablets, Apple TV, etc. This tool is more powerful than HandBrake. It can help you rip almost all DVDs including encrypted DVDs to MP4, MKV, AVI, and more formats, at faster speed. How to Rip DVD to MP4 Free for Mac with HandBrake? The first thing is to download HandBrake and install it. Make sure you have the latest version that with the newest functional improvements. Insert a common/non-commercial DVD disc with no copy protections like CSS, region code to DVD-ROM on your computer. Launch HandBrake on Mac (OS 10.14 included). Click Open Source to choose the DVD you have inserted to have HandBrake scan it automatically. The whole process may take some time, which varies from DVD drives and DVD content. 1: HandBrake will NOT be able to convert individual video files saved on a DVD-ROM. 2: By default, the longest title in the list will be selected. This is because main features in DVD movies usually have long titles. If the selected title is not what you want, just change the selection. Select MP4 files as output format to rip DVD to MP4 on Mac, and select other settings such as video quality, audio track, bitrate, subtitles, etc. Simply use Start or Pause button to control the process of ripping DVD to MP4 for Mac OS. HandBrake indeed grants users a admirable easy way to convert general DVDs to MP4 on Mac. But when it comes to copy-protected DVDs, HandBrake can only handle those encrypted with CSS with the help of libdvdcss. If you want to rip any DVD movies to MP4 on MacBook, iMac, Mac Pro or Mac Mini with no effort at all, the best HandBrake alternative - WinX DVD Ripper for Mac is greatly recommended. As a professional DVD converter, it is available to decrypt and rip any purchased, rent or homemade DVDs to MP4, MOV, AVI, WMV, MOV, MPEG, MKV, FLV and fashionable devices like iPhone XS (Max), iPad Pro, Samsung Galaxy S/Note, Sony Xperia, Surface Pro, Xbox, PS3/4 and more with Hi-fi images and audios in a few clicks. By supporting both Multi-core (up to 8) CPU using and Intel/AMD/Nvidia hardware acceleration, WinX DVD Ripper for Mac delivers superfastr DVD converting speed than other competitors. Steps: Input DVD Disc content -> Choose MP4 Video as output format -> Do some video editings and settings if necessary -> Click RUN to start convert DVD to MP4 on Mac with accelerated speed. 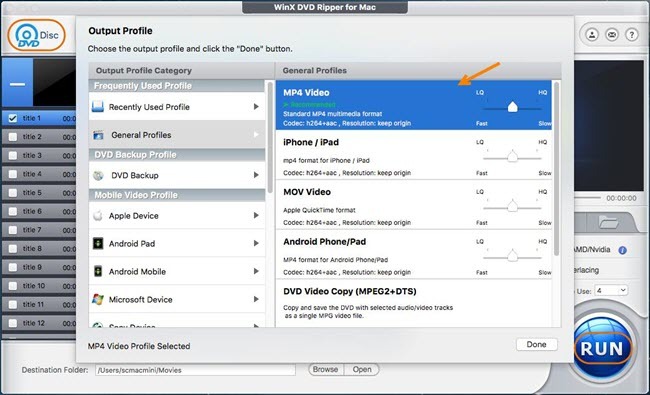 Tip: For ripping DVD to MP4 on Windows (10/8/7/XP), please take advantage of WinX DVD Ripper Platinum ( advanced version of WinX Free DVD Ripper), which also eanbles to convert any DVDs to a diverse of video formats and iPhone, iPad, Android, Windows devices at a very fast speed. Disclaimer: Digiarty Software does not advocate converting copy-protected DVDs for any commercial purpose and suggests referring to the DVD copyright laws in your countries before doing so. Best free way to convert DVD Video_TS folder to MP4 or other formats on Windows (10) or Mac. Free WinX DVD Ripper can convert Video_TS folder, DVD, ISO Image to MP4 for free in 3 simple steps. Handbrake scan failed? 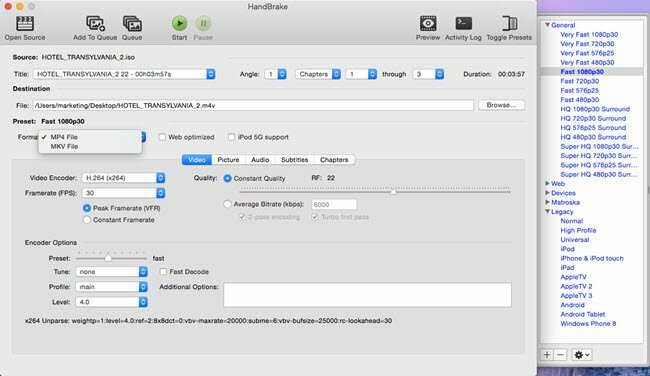 Try our solutions to fix 'Handbrake fails to scan files on Mac' to get video/DVD conversion to work. Part 1How to Rip DVD to MP4 Free for Mac with HandBrake?